Podcasting as a medium exists mostly because of Apple’s iPod. Before the MP3 player hit the market, there wasn’t much of an audience for mobile, digital audio on demand. Which is why it’s kind of funny that Apple’s iOS devices—the iPhone, the iPad, and the iPod touch—don’t offer much out of the box for consuming and organizing your favorite podcasts. Oh, sure, you can go the iTunes app on your device and download a single episode of the show you follow. 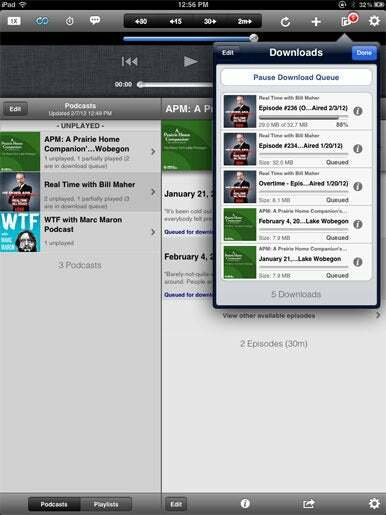 But you can’t subscribe to all of a podcast’s episodes from within the mobile iTunes app. And while you can listen to an episode in either the iTunes app or your device’s Music app, Apple’s approach seems designed to force you back to iTunes on your personal computer to subscribe and manage your podcasts. Luckily a slew of third-party developers have jumped in over the years to bring a little more order and convenience to the the iOS podcast universe. And a lot of them a really good. For the most part, these third-party offerings all let you search, subscribe, and listen to podcasts within a single app—and they can play in the background while you use other apps. Truth is: It’s hard to find a bad podcasting app in the iOS App Store. But some offerings are better than others. So how do you choose the podcasting app that’s best for you? Here’s what to look for if you’d like to take podcast management out of iTunes’s hands. There are plenty of podcasting apps that are optimized for the iPhone and iPod touch and will work—however inelegantly—on your iPad. The best offerings, though, give users the option of moving from your phone to your tablet and back again. This means that they’re built as universal apps, optimized for both devices. More important, they allow you to sync your podcast listening habits between devices. Under this criteria, Downcast ( )—a $2 app from Jamawkinaw Enterprises—is one of the best options out there. Assuming you used the same iTunes account to download the app to both your iPhone and your iPad, you can use iCloud to sync episodes, podcast subscriptions, and playlists between devices. You can subscribe to Radiolab on one device and listen to it on another. iCatcher ( )—$2, from Joeisanerd.com—also offers syncing capabilities between iOS devices, but not to quite the same extent. The app will sync playback times for podcasts so that you can interrupt This American Life on your iPhone and pick it up at the right moment on your iPad. Unlike Downcast, though, you can’t sync your subscriptions—you’ll have to subscribe to a show on both devices to accomplish the syncing. Vemedio’s $2 Instacast ( )—which is the most video-centric of all the podcasting apps I viewed—also offers syncing between devices, but with a catch: iPad owners have to pay $5 for Instacast HD ( ), the standalone iPad-optimized version of the app. It’s a limitation of the App Store that existing users of one version of Instacast can’t upgrade to the other, but you can always just install the iPhone version on your iPad: It will still sync with your phone, and if there’s any difference in video quality, it wasn’t noticeable to me. Nevertheless, this is a hurdle you won’t have to jump have to jump through with either Downcast or iCatcher. The rise of AirPlay streaming makes it easy to play music from your iPhone or iPad wirelessly to a great stereo system or an Apple TV. That can also be done with podcasts—though not every third-party app opts into Apple’s requirement that they be optimized for iOS 4.3 or later to support AirPlay streaming. Downcast, iCatcher, and Instacast all stay in the running under this criteria, but several other good apps join the race here. I was a big fan of Alex Sokirynsky’s $2 Podcaster app ( ) when I reviewed it a year ago; it has remained my player of choice on my iPhone. It lacks the iPad optimization and syncing, unfortunately, but its AirPlay compatibility keeps it useful. The same goes for Pocket Casts ( ), a $2 offering from ShiftyJelly. The chief attraction of this offering is its elegant-looking user interface and its AirPlay compatibility. But it is built mainly for the iPhone, just like Podcaster, and I don’t need two apps with the same capabilities and same limitations on my iPhone. More for sentimental loyalty than anything else, I stick with Podcaster—but either will do the job just fine if you only listen to and manage podcasts from your iPhone or iPod touch. I was pretty sure that Downcast was going to be my favorite offering in this roundup. 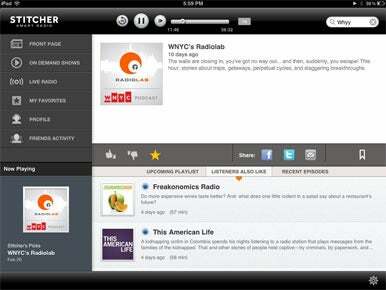 And then I met the $2 Stitcher Radio app ( ). After creating an account with Stitcher—this lets you sync your playlists and preferences between your iPad and iPhone—the app greets you with a “front page” of audio news stories popular podcasts. (Visually, this looks more like CNN’s app than any of Stitcher’s audio-oriented competitors; the display is functional on the iPhone but quite elegant on the iPad.) You can click on those stories, or select from a menu of live online radio stations and podcasts for listening. And you can use your preferences to create a Pandora-style custom station. Stitcher, then, is pretty nearly a complete audio-on-demand app. It’s almost, but not quite, perfect: While there is an expansive selection of live radio station feeds to listen to, my local NPR affiliate wasn’t on the list. Which means I still must use the NPR app if I want to listen to All Things Considered on my iOS device; Stitcher doesn’t do quite everything. It’s close, however. There are other good podcast managers that, for one reason or another, don’t quite make my list. Dorada Software’s $2 RSSRadio ( ) works on multiple devices, but it has a slightly less capable search engine. Stanton’s $1 Podcast Pro ( ) is a good, inexpensive, reliable podcast app for iPhone—and that’s about it. The very best offerings, though, offer amazing versatility. Stitcher Radio and Downcast top my list—and will be sticking around on my iPhone and iPad.